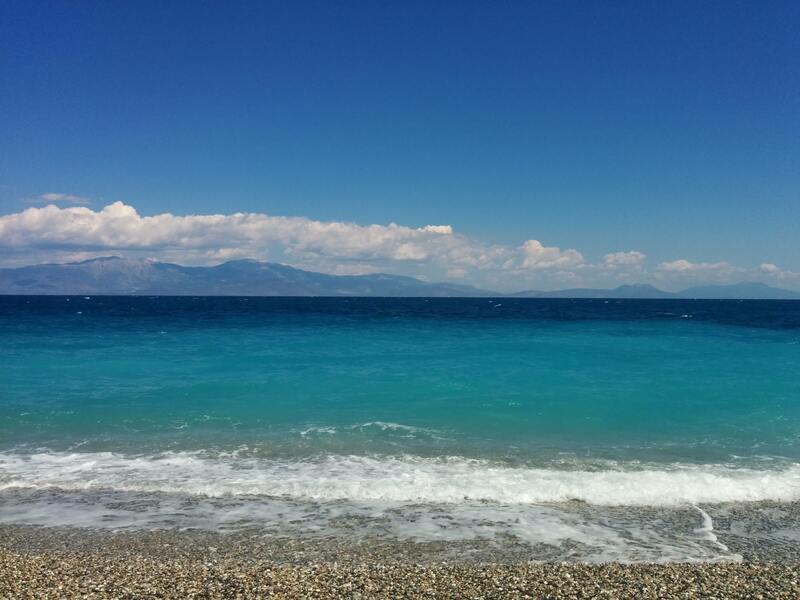 While preparing for a road trip around the Corinth Gulf and the North Peloponnese, I asked for family hotel recommendations on a Greek parenting forum. Lots of people referred me to Daphne's Club in Xylokastro. Curious about this accomodation, we decided to check it out. Read on about a special place run by a special lady. 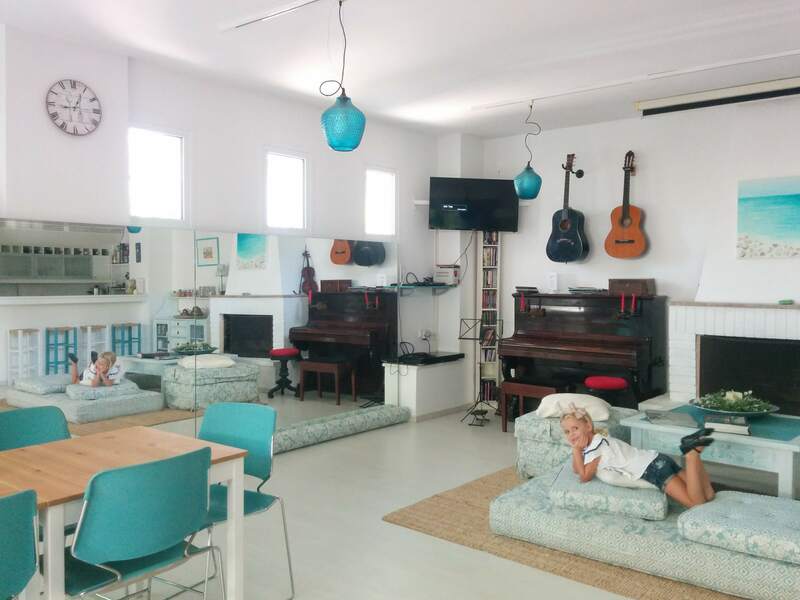 Family-friendly Daphne’s Club Hotel Apartments in Xylokastro is run by Daphne, a lady with an unbridled energy and vision. Not only for her hotel but for the whole region in which it is located. She has turned a vintage hotel from the seventies into a child-friendly haven of peace and creativity. A place where you immediately feel at home and where you can be active but also relax. 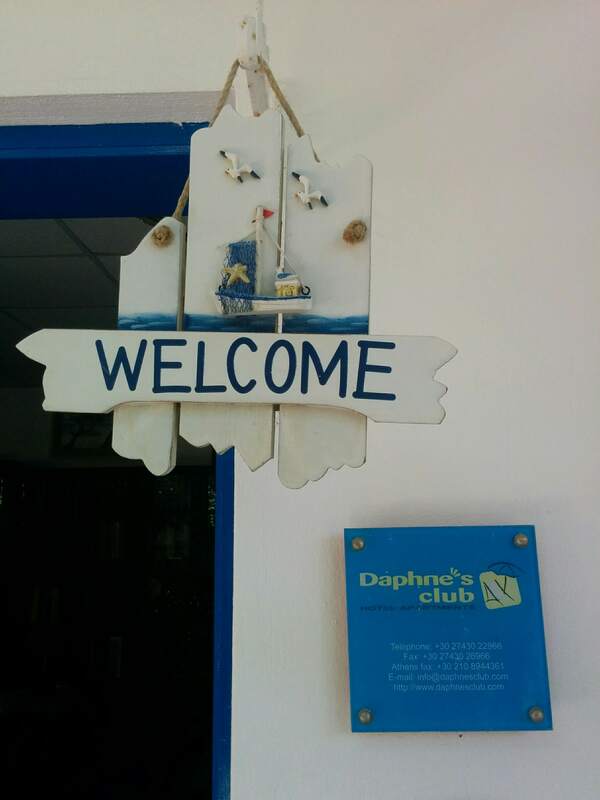 No mass tourism at Daphne Club. It is cozy, family-friendly and eco-labeled. Daphne’s Club is conveniently located just a stone’s throw from a pebble beach and pine forest on the Gulf of Corinth near Xylokastro (the tourist and cultural center of the area). It is easily accessible by car, plane or train (from Athens and Athens airport). The hotel offers apartments for up to 5 people. 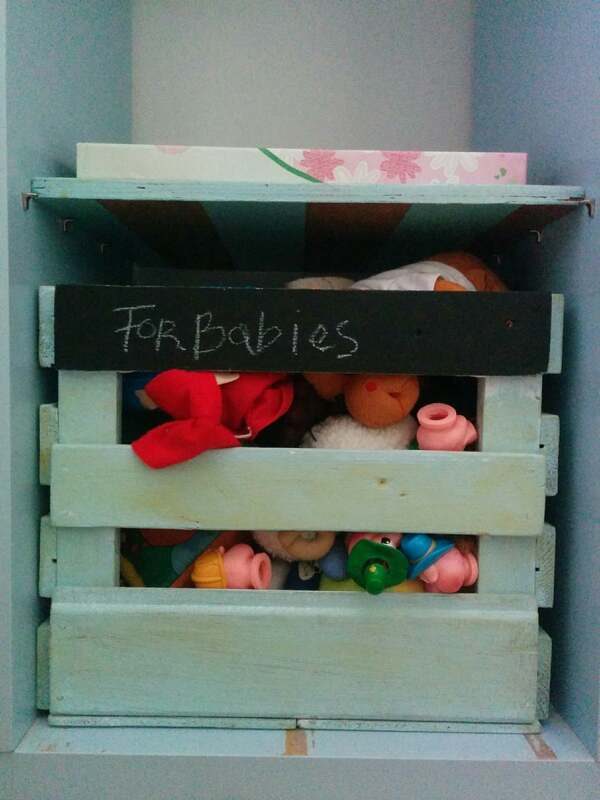 There are free bikes, a playground, Wi-Fi and great baby facilities. We came by car from Athens and it took us no more than 1.5 hours. We unloaded our bags in front of the small hotel and parked the car a few meters away from the hotel. 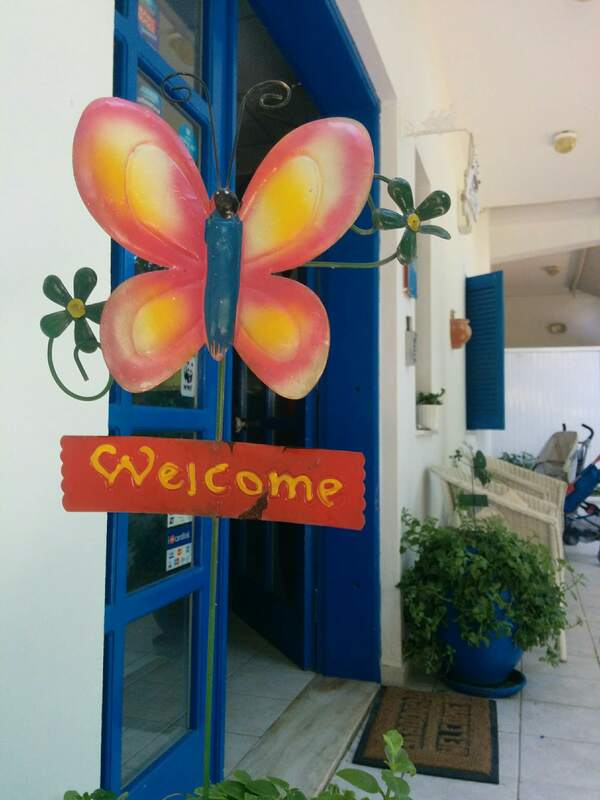 The outside of the hotel has the familiar traditional Greek elements such as blue doors and shutters. Lots of welcoming signs everywhere! The interior of the family-friendly Daphne’s Club Hotel Apartments is reminiscent of a boutique hotel with original vintage elements and lots of light. There is a multifunctional room for breakfast and relaxation as well as yoga classes, music performances, and other activities. With lots of crafts, painted stones, books, and musical instruments, the hotel has a creative vibe. There is a cozy reading corner with space for the children. 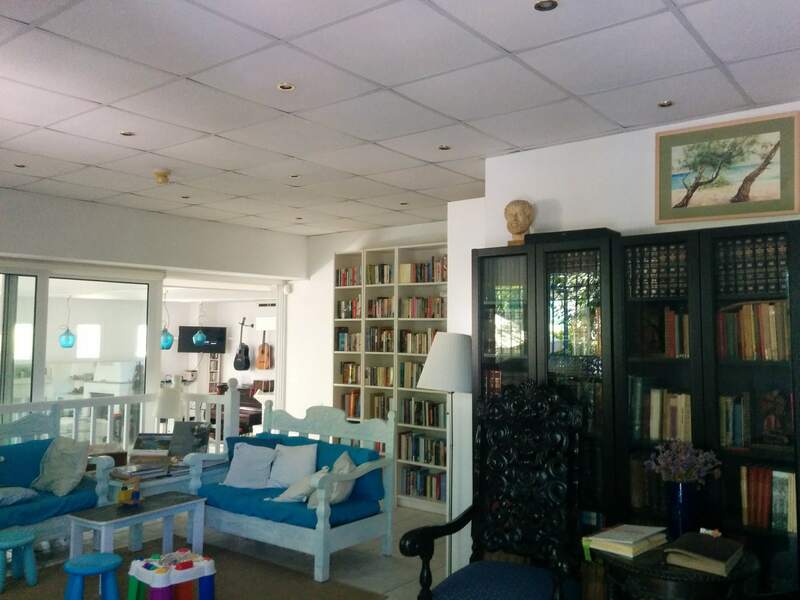 You will find toys, puzzles, children’s books, games and a library with international books. You can read quietly here while your little one crawls around. 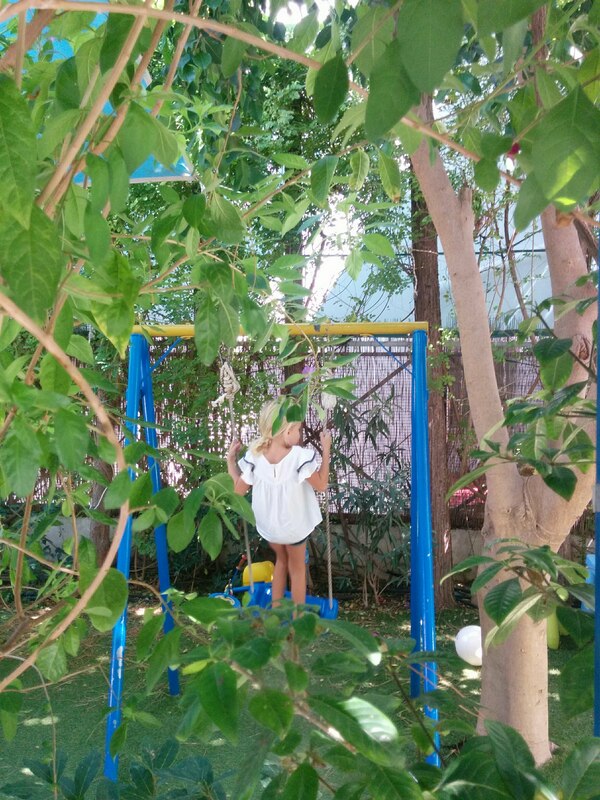 Outside is a shady flower garden with a small playground suitable for young children. The enormous roof terrace is worth mentioning too. This place is for enjoying a beautiful view, for eating, playing or exercising. Daphne encourages her guests to eat (you can bring your own food up the roof terrace) or spend the night here together. 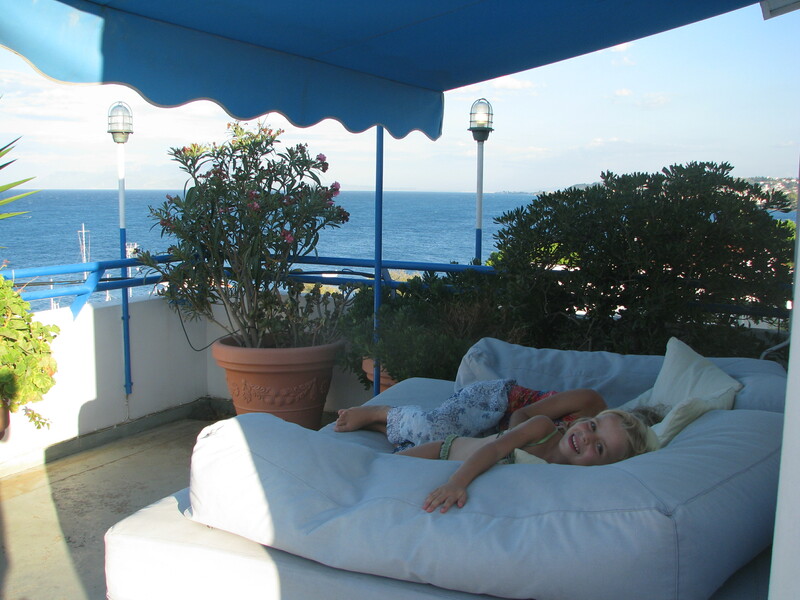 Pictured below you can see how my kids enjoyed the lounge chair (for the ultimate sunset experience!) and a big chess game. 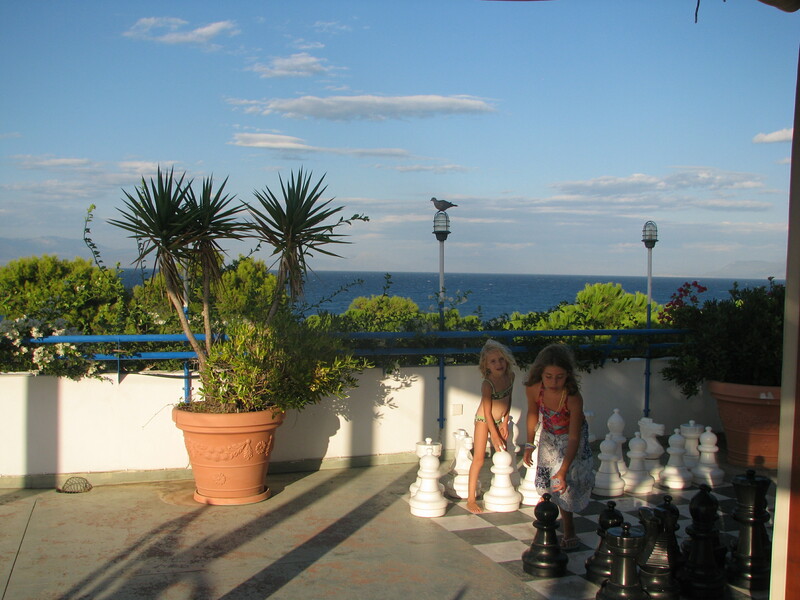 For a holiday with children at Daphne, you do not have to bring anything from home. Baby cots, child’s bed rails, high chairs, baby baths, prams, a steriliser for baby bottles, changing table, books for all ages, children’s toys and games, flippers, water toys, inflatable boats, air mattresses, swim boards, beach chairs, umbrellas, paddle boards, beach towels, baby literature , breastfeeding pillows; the list is endless. 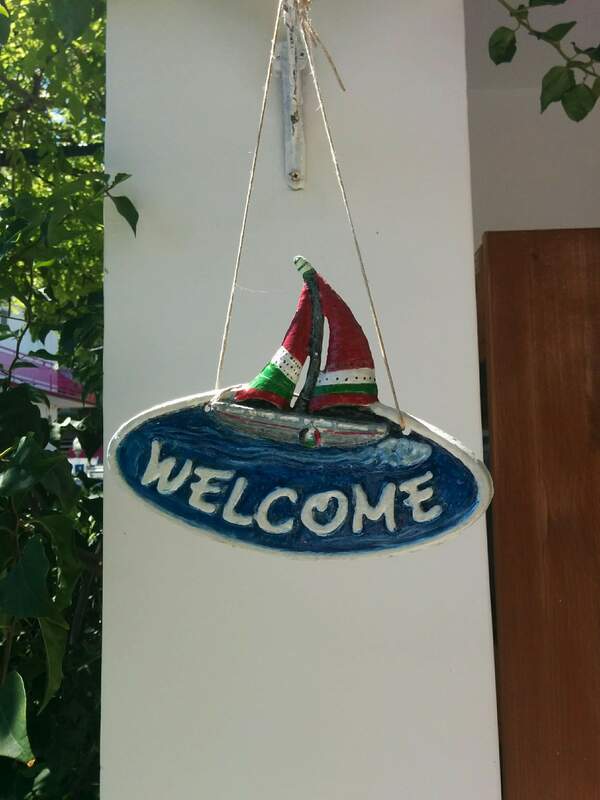 I believe that Daphne Club is a great place for people with small children who are not looking for a full-inclusive luxury resort but a small scale local experience full of things to do and see. 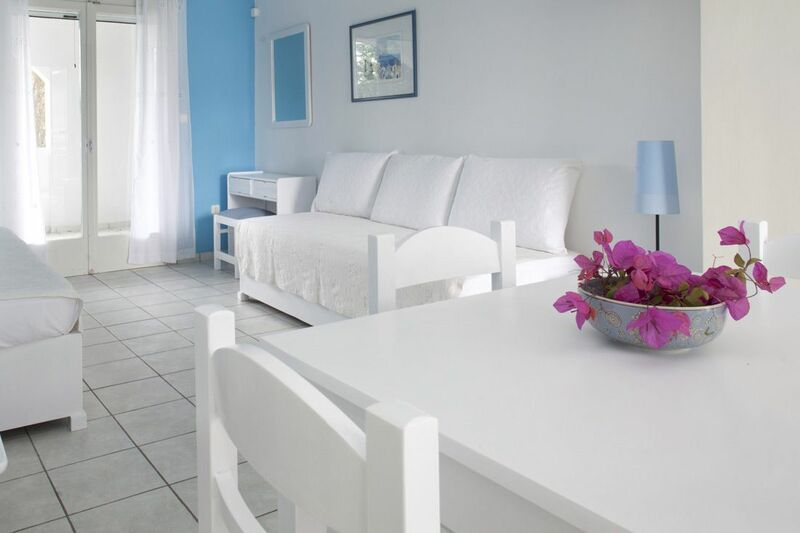 The family-friendly Daphne’s Club Hotel Apartment rooms are very spacious and clean. 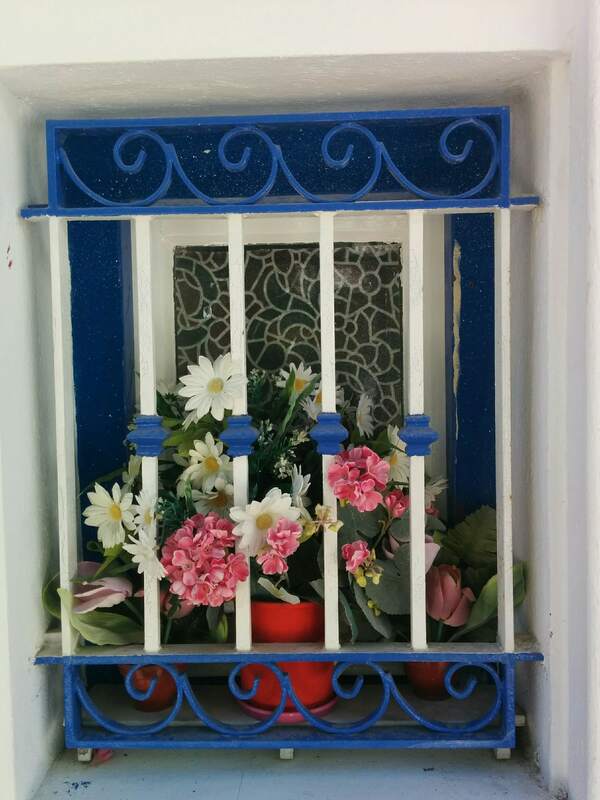 On arrival, we found fresh flowers in our apartment. Our room Dhalia had a separate large bedroom (with cushion from the Greek Coco-Mat brand) and plenty of closet space. The room also featured a large bathroom with Korres cosmetics, a huge balcony covered with jasmine flowers and lots of light and tranquility. The girls slept on large sofa beds in the living room, shutters guaranteeing total darkness. It was so quiet in the evening that we enjoyed the sound of the sea and the crickets from our bed. 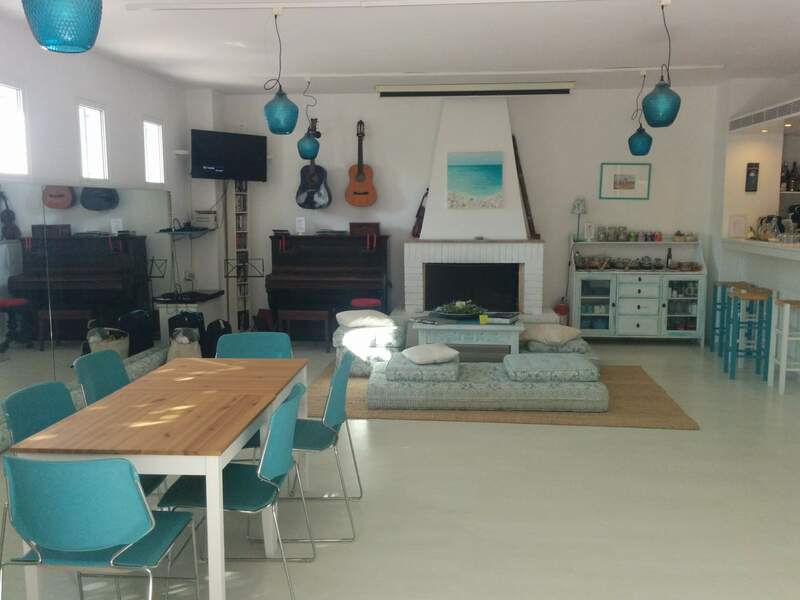 Honest photos of all rooms and the layout can be found on Daphne’s website. A lot is being organized at Daphne’s Club. Mindfulness, quality time, local products and sustainability are concepts that reflect the things to do at Daphne’s. From outdoor activities such as hiking, bungee jumping, dolphin watching and canyoning to excursions in the region focussing on food, archeology or nature. There is a weekly visit to the Farmers market, cooking lessons but also workshops for wine tasting, yoga, and even oriental dancing and aromatherapy. Specific weekends are being organized for special groups. There are regular baby weekends and Daphne also offers senior holidays activities. If these are all too much for you and your family, I would recommend to just play around at Daphne’s cute garden, walk to the beautiful forest next to the hotel or take a bike (with kids seats) and explore the area. 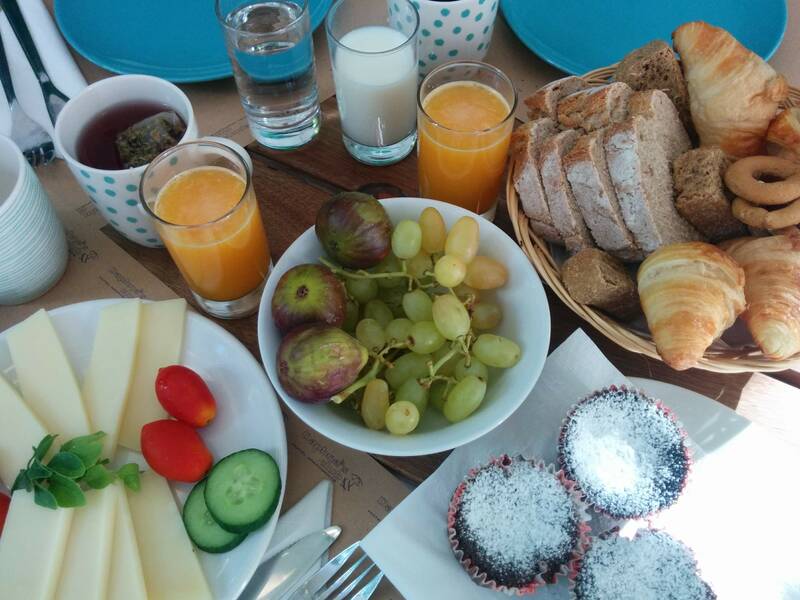 Breakfast was one of the highlights of our stay at the family-friendly Daphne’s Club Hotel Apartments. Forget about the usual 7 to 9 hotel breakfast, at Daphne’s you can have breakfast whenever you wake up. 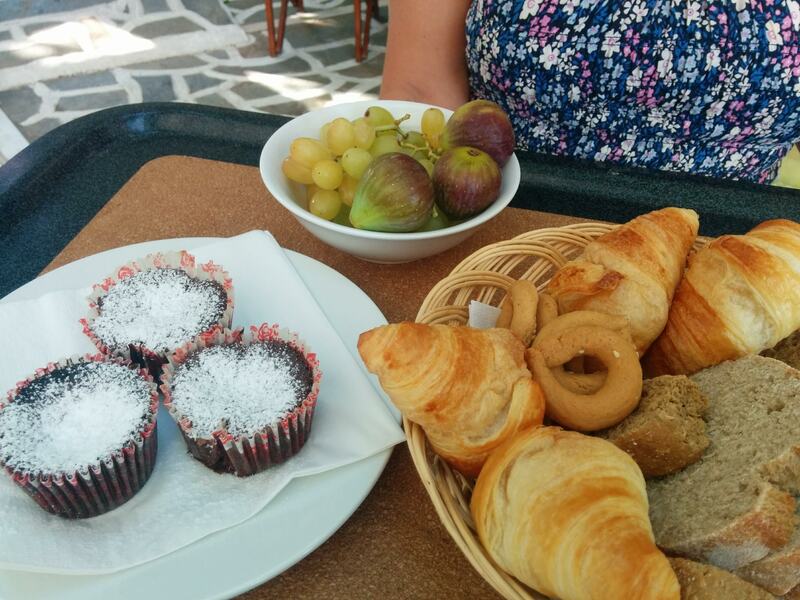 There is only fresh homemade bread, local produce and only Greek recipes are being used. 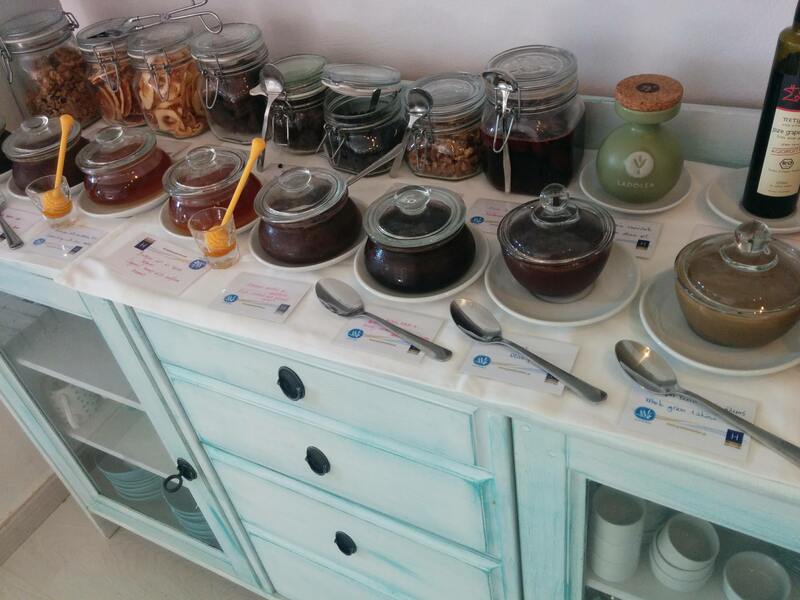 The hotel has received the ‘Greek breakfast’ certification. A recognized quality label that values local and organic products. This is just a selection from the breakfast menu: Cheese and sheep yogurt, organic olive oil biscuits, organic black Corinthian raisins, FairTrade filter coffee, homemade jams and croissants, homemade bread, pastries and pastries made from wholemeal flour from a local traditional stone mill, dried fruits, cereals and nuts, Greek honey with Chios mastic and Greek safran, Greek honey, black currant and almond, Greek herbal tea, fresh orange juice and fresh fruit smoothies, black olive paste and organic olive oil. For dinner, you can walk to the taverns at the nearby Xylokastro, it is 10 minutes walk over a safe stroller-friendly side road. 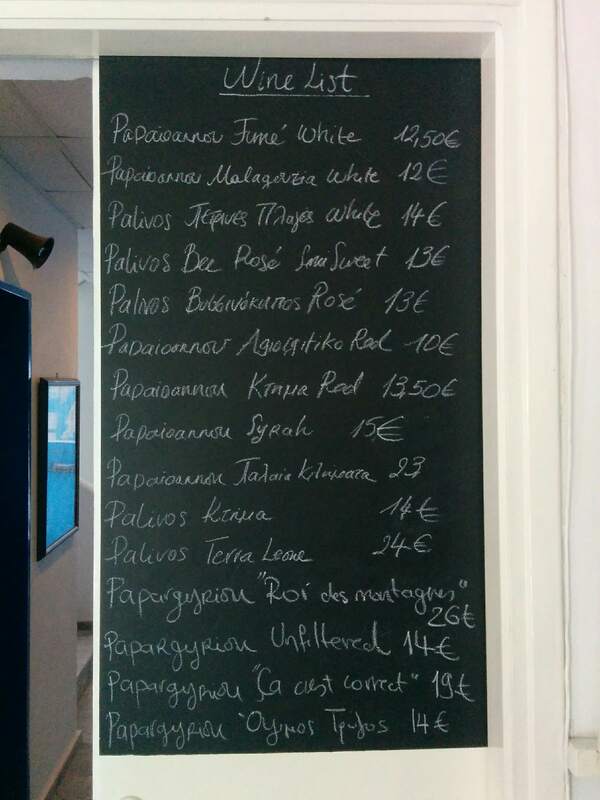 The taverns also offer to deliver at Daphne Club. If you do not want to eat out every day, you can order in or cook yourself at your apartment. There is a supermarket nearby. We ordered a meal and ate our food on the terrace overlooking the sea. The public pebbled beach is very close, not even a 2 minutes walk. 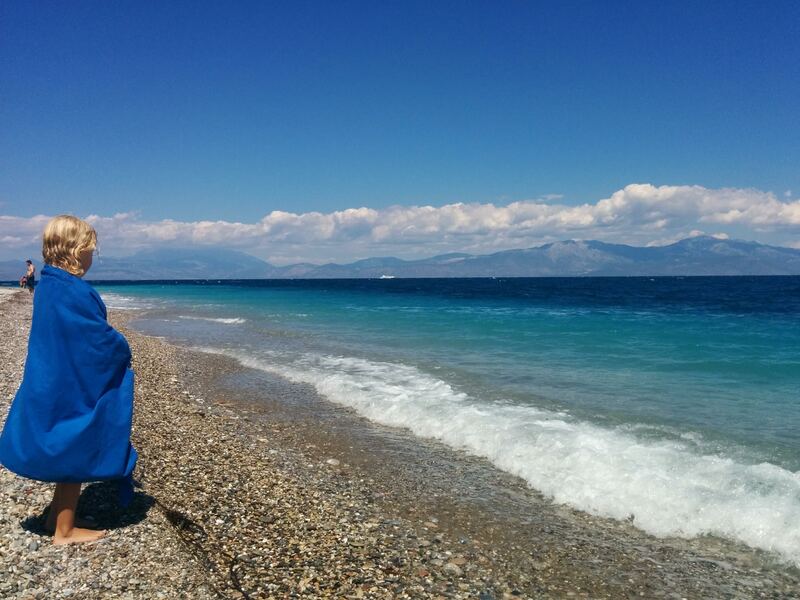 It is safe and protected here and that is why I let my children (aged 6 and 9) walk back and forth to the beach alone. The beach is not organized but Daphne provides beach chairs, umbrellas, cooling bags, toys, towels and anything else that you may need. You can bring your own snacks or visit the next door organized beach club. Daphne’s Club Hotel Apartments is a small and friendly hotel. 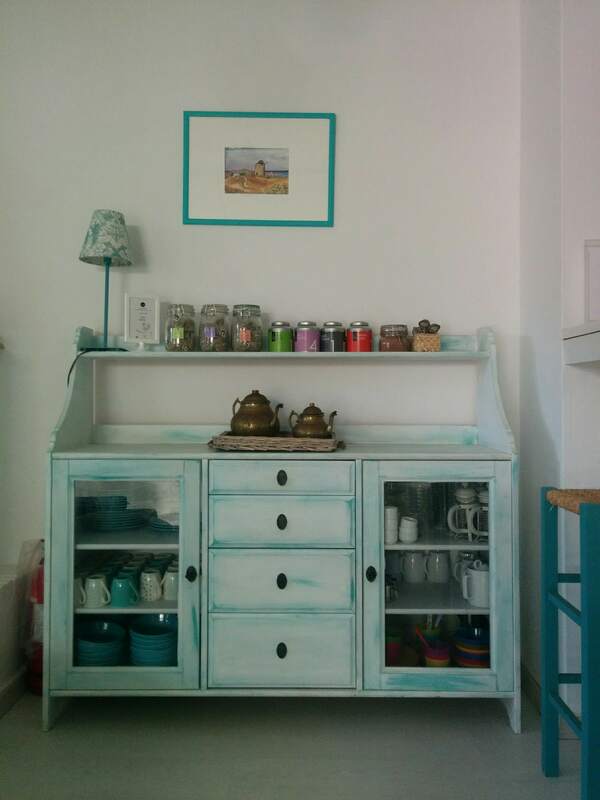 It can be a base for sightseeing in the Peloponnese. Daphne’s Club is clean and very well organized. Lots of useful information was provided before and during our stay. We felt very much at home and knew we were in good hands. There is a relaxed and informal atmosphere. Daphne’s is not just a hotel stay. 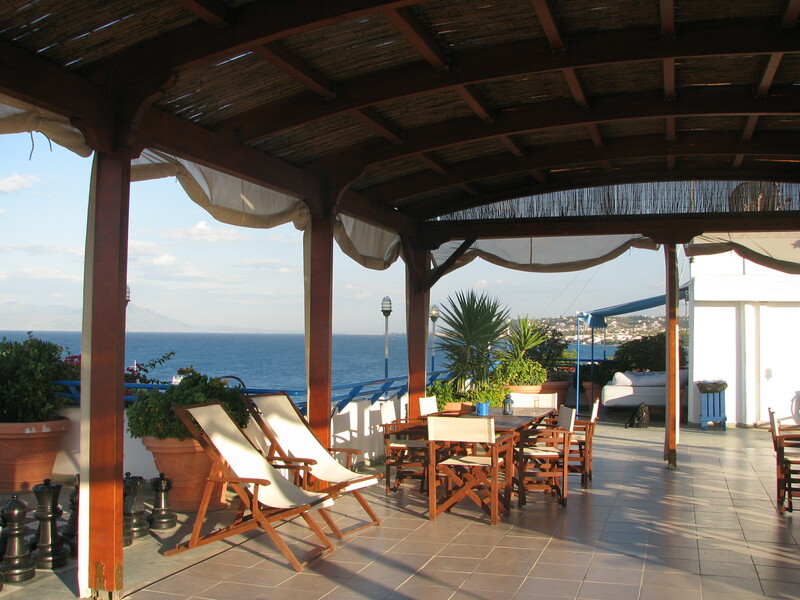 It is an experience blending in with Greek hospitality and the local products and region. It is also great place for being together, resting and spending quality time. Need to know more, drop me a comment below or send a message to the hotel here. Tip: Book directly on Daphne’s website for the best rate guarantee or check out daphnes club loyalty program for a repeater guest discount. The hotel is part of the Happy Guest Network. and there are offers for grandparents, single parents, car-free weekends and more. Disclaimer: I spent time at Daphne’s Club Hotel Apartments during the first week of September. We were invited by the hotel. However, thoughts and comments reflected in this post are entirely my own. Oh the photo with your little one on the bed is great! Loved it! 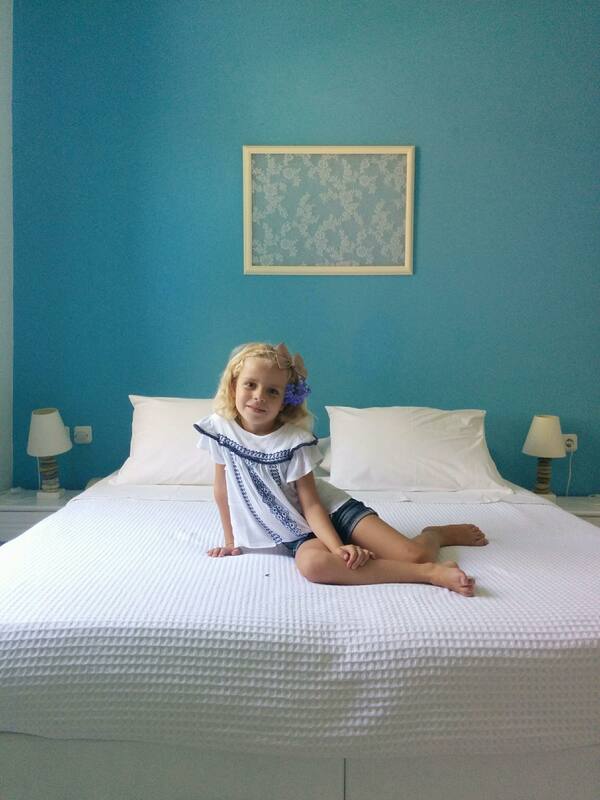 I think Daphne’s hotel is a child friendly hotel ideal for parents as well who want a heaven to rest! Thank you so much for your feedback Callie. It is indeed all that you described!